THE BACKSTAGERS HALLOWEEN INTERMISSION #1, a new special in October 2018 from series creators James Tynion IV and Rian Sygh, along with special guests Sam Johns (The Backstagers: Valentine’s Intermission), Shan Murphy (Bouquet), Abby Howard (Junior Scientist Power Hour), and Savanna Ganucheau (Bloom). With the days getting shorter and the nights getting spookier, the Backstagers are back for the Halloween season with all-new tales of terrors and creepy creatures. When Sasha accidentally falls asleep backstage, he ends up locked in the theater overnight! What lurks in the shadows, what terrors will he discover, and what the heck are the stage managers chanting? With back-up stories spotlighting your favorite Backstagers, this spine-tingling tale of the stage will leave you with goosebumps you can see from the back row! “A year back, Rian and I talked about how we might be able to continue to visit the world we had created in The Backstagers. We had the thought that we'd bring the sweet boys of the St. Genesius Stage crew back with a couple of oversized specials,” said James Tynion IV. “The first came out on Valentine’s Day, and let us delve into one of the core pillars of the series, the powerful love and friendship between our characters. But the second was always the one I was most excited about. The Halloween Intermission issue lets us expand the spookiest mythology behind the St. Genesius theater, to tell a genuinely frightening story that captures the heart and soul of the book and these sweet boys. I'm really proud of what Rian and I have cooked up for you, and with Sam Johns writing super spooky back-up stories for incredible art powerhouses like Abby Howard, Savanna Ganucheau, and Shan Murphy...It's going to be one heck of a Halloween!" 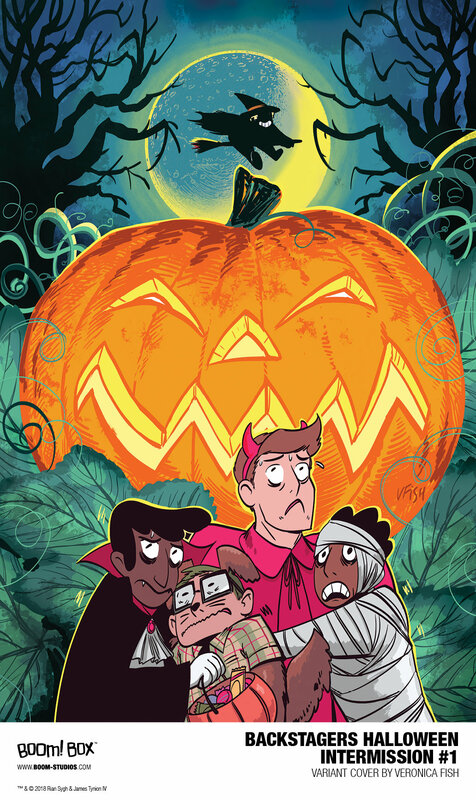 BACKSTAGERS HALLOWEEN INTERMISSION #1 features a main cover by Sygh and a variant cover by Veronica Fish (SLAM!). BACKSTAGERS HALLOWEEN INTERMISSION #1 will be ON THE SHELF October 2018. Have you read Backstagers? Let us know in the comment section below. Also, don’t forget to Like, Share and Subscribe to all things Constant Collectible so YOU can keep up to date with all the news and reviews from a world of GEEK CULTURE.